Deirdre O’Brien, a 30-year Apple veteran, will lead Apple’s Retail and People teams. Angela Ahrendts, Apple’s current senior vice president of Retail, plans to depart the company in April for new personal and professional pursuits, the Cupertino giant said in a statement on Tuesday. Ms. Ahrendts, formerly CEO of Burberry, had joined Apple in 2013. 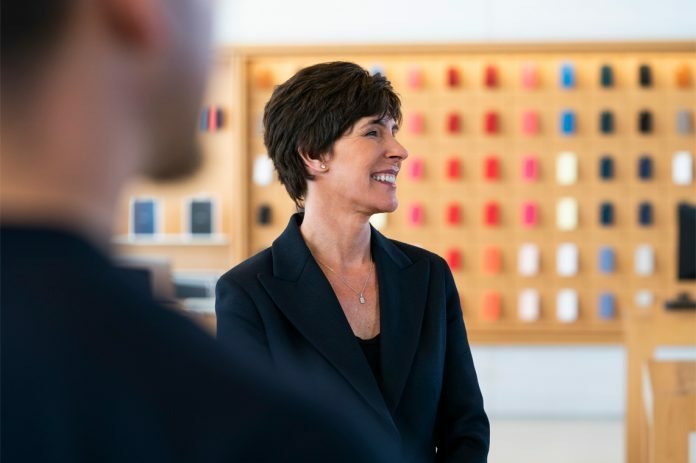 Ms. O’Brien is taking on new responsibilities for Apple’s retail and online stores in an expanded role as senior vice president of Retail + People, says Apple. She will be reporting to company chief executive Tim Cook. Ms. O’Brien will continue to lead the People team, overseeing all People-related functions, including talent development and Apple University, recruiting, employee relations and experience, business partnership, benefits, compensation, and inclusion and diversity, says Apple. Apple currently operates 35 online stores and 506 retail stores across the world.